As EHR’s are adopted as standard practice across the healthcare industry, a growing number of providers are experiencing dissatisfaction with the inefficiencies and limited functionality of their systems. There are many reasons why EHR satisfaction is low, but regardless of cause, it is incredibly frustrating for end users. Providers are focused on giving exceptional care to their consumers but often view their EHR as a barrier. Like any other tool, there will always be some level of frustration, but we have found a few things that boost adoption without fail. Below are our top three ways to boost EHR adoption and satisfaction within your organization. This one seems pretty obvious. 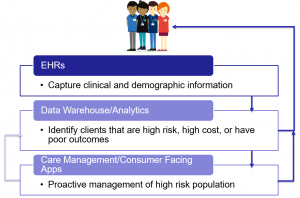 Selecting the right EHR can be straightforward, but only if you follow the right approach. Without a structured process, organizations end up with systems that sound great during the sales demos but don’t support the day-to-day work of their staff. The most important part of selecting the right EHR is to start by defining your business needs and goals. Once those are well defined, you can use them as a guide to consistently compare products along the way. You can read about the full process in this paper if you are currently looking for an EHR. Along with the distinct steps of the vendor selection process, meaningful staff engagement is needed to make the proper selection. Once the search begins for a new EHR, you should engage staff from across your agency to take part in the process. This should include all departments and programs. For example, clinicians, finance/billing, front desk, medical, and IT should all have representation. Incorporating a variety of voices into your planning will do two essential things. The first is that it will help to ensure that all roles, responsibilities, and functions have representation in the strategic plan and selection of a new system. Secondly, including these staff from the start of the project will help to create the buy-in which is essential for success with large-scale projects like this. “EHR Optimization” has become a trendy buzzword over the last year; for a good reason. During implementation, most organizations expend an extraordinary amount of energy just trying to get a system “live.” During this window, they don’t usually have the time and subject matter expertise required to ensure that each requirement aligns with the best workflow. Behavioral health organizations are also continually making iterative changes to their processes, programs, technology, and locations. When this occurs, there are always updates needed within the EHR to create a more efficient path for staff. There is a slightly different approach to optimization for each of the four areas above, but the overall concept is similar. Of the three items in this article, this one is the most important for creating long-term EHR satisfaction. It is also the most critical factor for building continuous clinical and administrative improvement across your organization. The reality of an EHR is that it is mostly a data collection tool. Other than your static reports, there is very little feedback that your EHR provides to your staff. This paradigm helps to fuel the dissatisfaction that users have with EHRs. The key to re-framing this relationship, and improving clinical quality, is to create a healthy feedback loop based on data. Let’s use the example of trying to improve the outcomes for your high-risk populations. Your staff enters demographic and clinical data into your EHR for all of your clients. From there, you need a way to identify at-risk consumers and notify your team so they can take appropriate action. This is where tools like data analytics and care management platforms come into play. From the picture below, you can see how these systems work together to provide valuable information to your staff. This feedback will inform better care for your consumers, but will also help your team see the value of the time that they are putting into the EHR. Moving from the speed of writing narratives on paper charts to the world of structured data in an EHR was never going to be easy. And it was never a task that would be “finished.” By choosing to create engagement and find the right tool from the start, you can eliminate rework that can drag your organization down well after your new system launches. You will then have the ability to optimize your EHR and feedback loop to create a culture that will help you succeed well into the future. Afia is here to support your optimized EHR experience no matter what stage you are in. Get in touch today and we’d be happy to brainstorm how we can get you closer to loving your EHR.